I never ate a beet, until last week. If you eat them regularly, then you’re probably laughing right now… because I’m giggling at myself a little bit. My husband swore they were horrid, and it was one of the things he was “tortured” with eating growing up – canned beets. Well, my mom never fixed them. I assumed I must be blessed with the way my husband spoke of these lovely roots. I’m actually surprised she didn’t make us eat them – she was pretty good about making us eat “all things terrible” while my friends got the “yummy foods” from boxes… things like ho-hos and mac-n-cheese. What’s the saying about how you don’t realize how SMART your mother is until you’re grown? Yes, this definitely applies to me. We ate lots of “brain food” and our snacks were fresh fruits and vegetables. (and WHOLE WHEAT for that matter) But beets were never on the list. I’m going to guess either she didn’t care for them, or didn’t like dealing with their royal red mess? I tried some beets in juice about a year ago, and once was enough for me. I was pretty sure my husband was accurate. In defense of the beet family, it was NOT an organic beet, and “earthy” or “DIRT” comes to mind. The color was gorgeous. The taste was horrid. Beets are mentioned time and time again in health blogs, books and now my chiropractor had mentioned them more than a few times to me. Then my good friend started sharing that she was loving BEETS a lot too… and I really got curious. Could this root really be tasty? 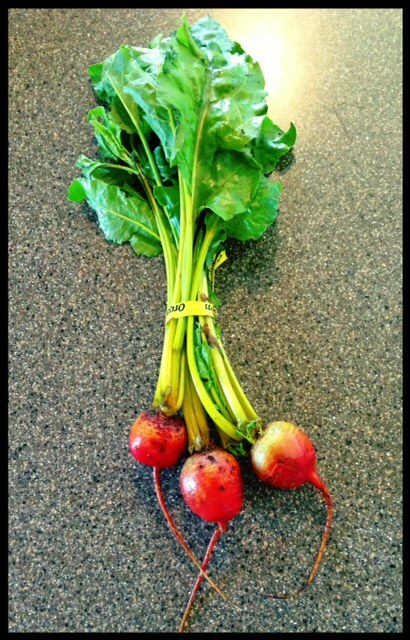 Maybe I just got a “bad beet”… and organic will be better? How do I fix it? Can I choke it down? Well the PROS of beets, far out weighed the cons, because I can tell you that beets are actually VERY tasty. No spices needed. I simply steamed them, and roasting in tin-foil is a good option too – and I’ve been eating them warm or cold – daily! So WHY are beets so good for you? 2. Medical studies have also shown that including beets in your diet helps protect a body against heart disease. 3. Beets contain sodium, magnesium, calcium, iron and phosperous. They are considered a fiber food and contain vitamins A and C and niacin too! 8. Beets also contain numerous phytochemicals, including quercetin, (which I take to fight off seasonal allergens) and other potent antioxidants. So they must help against allergy issues too! We also picked up some smaller, golden beets. They are great cold on a salad or steamed also with other veggies. Mild tasting and delicious! 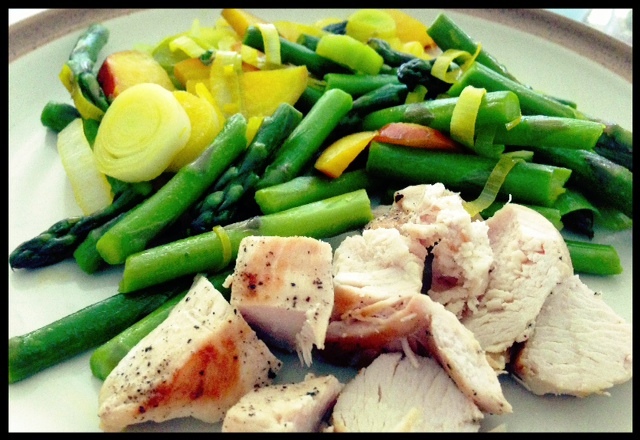 Golden beets served with leeks, asparagus, and organic chicken! Posted on May 20, 2013, in Auto Immune Disease, Celiac/Gluten Sensitivity, Food To Try, Truth and tagged Beets, beets turn stool red, blood in stool after eating beets, healthy for him, organic beets, why beets are good for you. Bookmark the permalink. 5 Comments. I LOVE LOVE BEETS— & THERE ARE SOOOOOOOOOOOO MANY DIFFERENT VARIETIES– EAT CHEMICAL FREE– & DON’T FORGET TO EAT THE TOPS ALSO!!!!!! 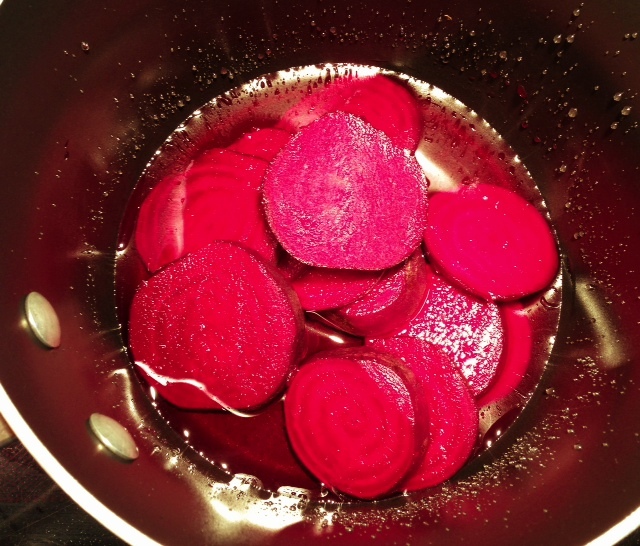 I HAVE A LOT OF LIVER PROBLEMS SINCE I HAVE SUFFERED WITH MCS FOR MANY MANY YEARS– I FEED MY LIVER — WITH BEETS!!! GREAT INFO!!!!!!!! THANKS FOR SHARING IT!!!!!!!!! If you are going to eat beets every day, you should probably educate yourself on the link between beets and kidney stones. Trying to be helpful, thanks for your comment from Denver, CO 🙂 I do eat parts of beets everyday – and enjoy them greatly. While oxalates might be a concern for people who are prone to kidney stones – I am thankful to have never experienced issues like that! If you are a prone to them, definitely be careful over dosing on oxalates! You always have such great encouragement Sonda. 🙂 Thanks for your positive words. 😉 Here’s to health!